According to Diario AS, Turkish side Kayerispor will sign Bernard Mensah on permanent deal this summer. 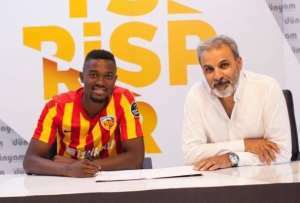 The Ghanaian midfielder is currently on loan at Kayserispor, who wish to sign him outright, but Besiktas are also reported to be keen on a deal. “The player has been on loan to our team since last summer, and our contract ends at the end of the season,” explained Kayserispor president Erol Bedi. “He has two more years of contract with Atletico Madrid and for us there is only one possibility, because we do not want another loan deal. Mensah has won three caps for Ghana and has enjoyed previous loan stints at Getafe and Vitoria Guimaraes. The 25 year old currently recovering from injury.